The ceremony occurred at the closing event of the 3rd Russian Conference on Medicinal Chemistry. The winners were congratulated by Rector Ilshat Gafurov and Chief Federal Inspector in Tatarstan Rinat Timerzyanov. Inspector Timerzyanov was the one handing over the awards. The grant for young scientists gives 600 thousand rubles for a year to PhDs (candidates of science) and 1 million rubles to DScis (doctors of science) to finance their research. The contest covers 10 big research areas; PhD holders under the age of 35 and DSci holders under 40 are eligible. 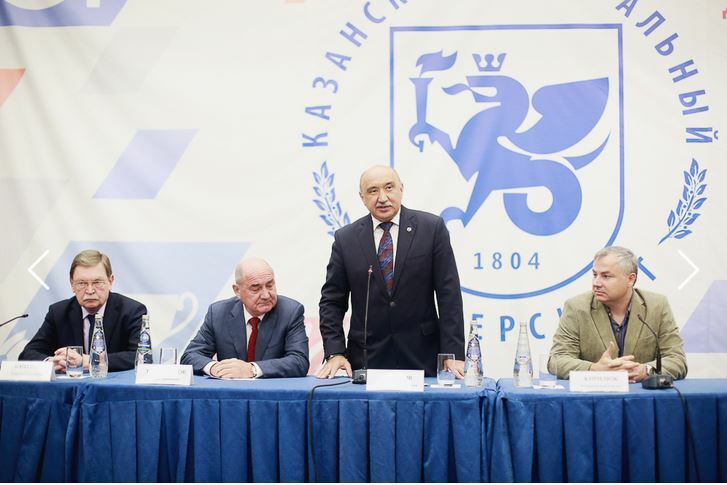 12 people won this year in Tatarstan, and five of them represent KFU: Ayrat Ziganshin (Institute of Fundamental Medicine and Biology), Ramil Kashapov (Institute of Engineering), Pyotr Kuzmin(Yelabuga Institute), Yana Mukhamedshina (IFMB), and Almaz Sayfutdinov (IE). Dr. Ziganshin is the only doctor of science in the list. As he noted, natural forest phytocenoses only occupy 17.6% of Tatarstan’s territory. The existing forestry program in the Republic states that this ratio should rise to 25% by 2020. The lagging in implementation has already become evident, and this is in a large measure caused by the lack of scientific data. “The results can then be used to solve practical tasks of creating sustainable and productive plantings. Moreover, we will be able to use wood plants to more precisely evaluate environmental conditions. This will help prevent pollution at the earliest stages”, said Dr. Kuzmin.